Today I’d like to cover choosing the right solder for the job! There are so many different types of solder that it can be daunting when first starting out… so let’s figure out how to decide what will work best for you and your application. There are three basic decisions to make when choosing solder and those are form, alloy, and size. Your specific application and preferences will determine which will work best. For general purpose electronics soldering work, almost everyone will begin with solder wire because it is the easiest to work with and most familiar. Solder wire is perfect for Thru Hole soldering where you have decent sized components. You can do SMD work as well but it works best with thinner gauge wire. For SMD work on very small components, solder paste may be necessary because it will give you greater control over where the solder is being applied. You apply the paste directly where you need it and then apply your heat source. Hot air works best with solder paste. When precise amounts of solder and repeat-ability are needed pre-forms may be the answer. Pre-forms come in a variety of shapes and sizes and are usually best suited for high volume industrial production. The last two types have a bit more limited uses, solder bars are mainly used for things like solder baths, plumbing work, roofing, and industrial applications. Whereas solder spheres are only used for re-balling BGA chips and other integrated circuits. Once you have determined what solder form will work best for the job, you will need to choose an alloy. This is the mixture of metals that makeup the solder. One of the biggest debates that always comes up is whether to use lead or lead-free solder. The combination of lead and tin was originally chosen because of its low temperature melting point and great wetting abilities. For these reasons it is very easy to work with and many will swear by it. One golden rule of soldering though is to always match the alloy with the piece you’re working on. For example a stereo receiver made in 1960 would have been constructed with leaded solder so that’s what you should use to repair it. As we have come to realize there are health risks to working with lead so in 1996 lead free alloys were developed and patented by the Ames Laboratory. In 2006, lead free directives and RoHs compliance were created so nowadays almost all consumer electronics manufacturing is done with lead-free solder. In the end the decision is up to the user but always remember you want to avoid mixing alloys and keep the chemistries consistent for the best results. Here’s a chart with some popular alloys and their common uses. 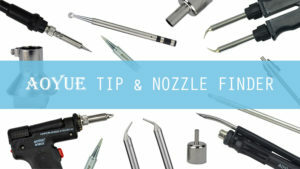 The final decision to make is how much solder you need and what diameter or gauge to use. For solder wire a 1 pound spool will potentially last years depending on usage. For quick jobs or testing of new alloys you might want to go with a 2-4 ounce spool. In addition to the amount of solder to get you will also need to choose a diameter, for general purpose .031 or .032 inch will do, for bigger jobs .062” is great. And for smaller more intricate jobs you may want to go with something like 0.020 inch. The thing to remember with smaller gauge wire is that from a manufacturer’s standpoint the finer it is the more difficult it is to keep the flux core consistent throughout. It is also more expensive to purchase. 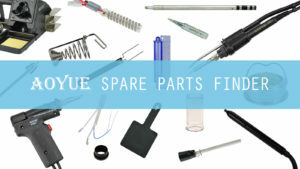 Therefore you may get wetting issues and need to add more flux to get a decent solder joint. Just make an educated guess based on the size of the components you’re working with and you should be good to go! Well that’s all for today, please leave us a comment and tell us what you use for your jobs! Also, be sure to check out our YouTube channel for more soldering tips and tricks!